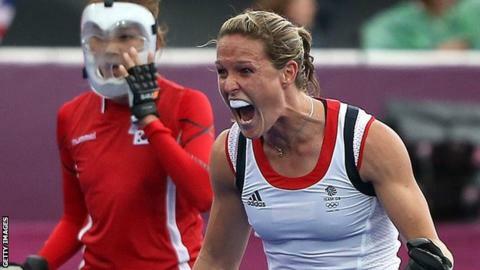 Olympic bronze medallist Crista Cullen has given up protecting elephants, working for a security firm and running a fitness business to return to playing for Great Britain. Cullen, 30, moved back to Kenya, where she spent much of her childhood, after helping GB finish third at London 2012. Now she has been named in Britain's squad for December's World League Final in Argentina. "I'm over the moon to make the cut," she told BBC Sport. "Being from Kenya, and with my family out there, I was excited to go back home. After three years away I hadn't considered coming back, but then I was given an opportunity by the head coach Danny Kerry." Cullen, who has 171 international caps, was the joint top scorer at London 2012 with four goals. She came out of retirement in July and played two practice matches against the United States in October. When asked about what she did during her time away from the sport, Cullen said: "I've always worked outside hockey. When I returned to Kenya, I worked at a security firm and set up a 'cross fit' company. I also got my pilot's licence. "I did voluntary work with wildlife conservancy that my dad mainly manages on the side of Tsavo East National Park in Kenya. We are suffering from elephant ivory and rhino horn poaching. I was trying to protect the small area we were looking after." The defender's inclusion is one of three changes made by Kerry to the 18-woman squad who secured qualification for the 2016 Olympics in Rio de Janeiro by winning the World League Semi-Final tournament in Spain in June. Great Britain are among eight teams at the finals, to be played in Rosario, Argentina, in December. Goalkeepers: Maddie Hinch (Holcombe), Kirsty Mackay (East Grinstead). Defenders: Crista Cullen (unattached), Emily Maguire (Reading), Sam Quek (Holcombe), Kate Richardson-Walsh (Reading), Laura Unsworth (East Grinstead), Hollie Webb (Surbiton). Midfielders: Ashleigh Ball (Slough), Joie Leigh (Clifton), Helen Richardson-Walsh (Reading), Susannah Townsend (Canterbury), Georgie Twigg (Surbiton). Forwards: Sophie Bray (East Grinstead), Alex Danson (Reading), Hannah Macleod (St Albans), Lily Owsley (Birmingham University), Nicola White (Holcombe).